The Italian motorcycle company Ducati set an e-commerce record this January when it introduced its latest model online. The company sold the entire first year production of 500 units within 31 minutes. Customers from Europe, North America, Asia, and Australia screamed through the point, click, and purchase sequence for the $15,000 limited-production vehicle, eager to place a 10 percent deposit on their credit cards. Driven by demanding Ducatisti, as the bike's fans are known, the venerable company revved up and peeled out. 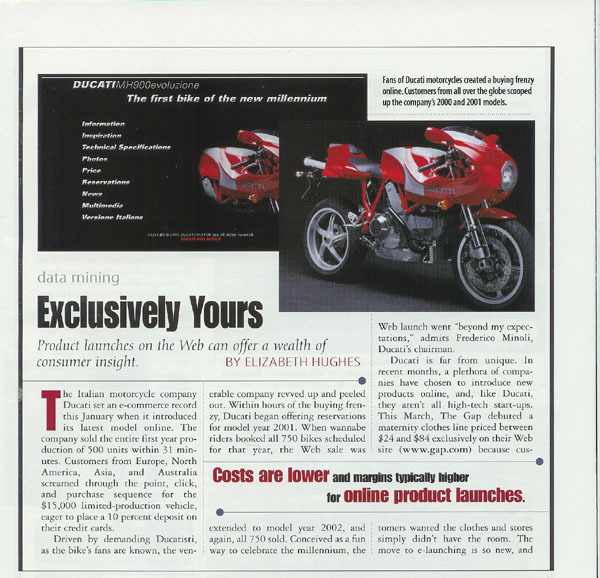 Within hours of the buying frenzy, Ducati began offering reservations for model year 2001. When wannabe riders booked all 750 bikes scheduled for that year, the Web sale was extended to model year 2002, and again, all 750 sold. Conceived as a fun way to celebrate the millennium, the Web launch went "beyond my expectations," admits Frederico Minoli, Ducati's chairman. Ducati is far from unique. In recent months, a plethora of companies have chosen to introduce new products online, and, like Ducati, they aren't all high-tech start-ups. This March, The Gap debuted a maternity clothes line priced between $24 and $84 exclusively on their Web site (www.gap.com) because customers wanted the clothes and stores simply didn't have the room. The move to e-launching is so new, and "happening so quickly," according to Wendy Liebmann, president of WSL Strategic Retail in New York, it is almost impossible to quantify. The reasons why are not. In fact, there are a rainbow of reasons why companies have turned to the cybershelf. Costs are lower and margins typically higher than with a traditional product launch, and firms are able to modify their sales approach quickly and often. For marketers, the practice is a bonanza. Businesses can tailor products for specific markets, and gain access to a database of friendly customers who are eager to dispense advice. "We found out that the Internet is a fantastic tool for international communication. Ducati is an international brand. Put them together, and there is a huge potential," says Jason Jacobs, Ducati's director of investor relations. Cameron Meierhoefer, an e-tail and retail analyst with PC Data in Reston, Virginia, believes the push toward online launches is a trend that will grow, although the percentage of these rollouts "will depend on the industry," he says. For example, many established electronic manufacturers are tied to agreements with retailers. But for small companies making and selling their own products, Meierhoefer predicts close to 100 percent of launches will eventually be online. "It will let them control the scale of the rollout while production is still low," he notes. Just ask Command Audio of Redwood City, California (www.commandaudio.com). Offering the world's first wireless audio-on-demand system, the company decided to bypass traditional establishments at first. "We opted for an e-launch because we had something that most consumer electronics retailers didn't deal with," says Wilson Craig, Command Audio's public relations manager. "It's a totally new service, a totally new product. We wanted to introduce it." Command Audio's service allows listeners to access hundreds of audio programs on a handheld receiver, giving a commuter the option of listening to NPR's "All Things Considered" or audio versions of the Wall Street Journal or Sports Illustrated no matter what the time. The service, launched last December in Denver and Phoenix, is scheduled to be in the top 50 radio markets by next year. To introduce such an innovative product, Command Audio representatives visited in-market trade shows, and told interested consumers to go to the Web site if they wanted to buy the new units. The company then targeted this first generation of purchasers, calling them for lengthy conversations to determine what they liked and didn't like about the service. They also asked questions such as: What was your experience when you opened the box? Did you have an easy time finding the programs you wanted? How was the listener care service? Craig says the company used the customer responses to make major changes to programming, the Web site, and customer service before the retail launch in mid-March. "Once we got to retail, there were new issues," he says. "But with the Web launch, we knocked out the big ones." The ability to find out what core consumers think is one of the biggest advantages of online launches. Larry Burns, CEO of the Carol Stream, Illinois, market research firm StartSampling Inc., likens Web launches to getting focus group reports "without having to get on a plane and look through the mirror." At San Francisco-based kerna LLC, a Web launch of Razer Boomslang, a mouse designed to improve the performance of PC gamers, has left company representatives feeling like they've formed a kind of community with their customers. "The feedback on the product has been amazing," says Sandra Goldberg, the company's CEO and president. "We're getting a couple dozen e-mails a day. In retail, if you get one a week, you think that's pretty good." The reverse is true, too. Karna found customers more likely to read updates and other information when it was sent via e-mail, reducing, if not eliminating snail mail expenses. Karna chose a Web launch after making the decision to market its product to gamers. Kerna's technology can be applied to a host of devices with medical, engineering, and design applications — wherever dexterity, precision and speed are paramount. But testing by various targeted groups of mouse users proved gamers were most enthused about kerna's product. When the company learned that a good majority of America's 35 million gamers (most of whom are in their 30s, with income in the $50,000 range) are already heavy Web users, it decided to move to a November e-launch, which also eliminated the expense of getting the unknown product into retail. The launch's strong press created such buzz that retailers such as Electronic Boutique approached the company about stocking the mouse on their shelves. Like Command Audio, kerna also used its e-relationship with early buyers to its advantage. For example, when tweaking the beta version resulted in some shipping delays, the firm e-mailed buyers to explain. Goldberg says that consumers responded positively to the fact that the company was taking the extra time to make a mouse that would roar. Without the dialog, the delay could have been a disaster. However, an e-launch is not always a smooth proposition, as Handspring learned in October. The Bay Area company targeted male business travelers between the ages of 35 and 54 for the introduction of its personal digital assistant, the Visor. Strong press created a wave of anticipation, driving droves of consumers to www.handspring.com, which promptly crashed under the onslaught. Orders had to be put on hold, as Handspring hired and trained a larger telephone sales force to handle the traffic. "We didn't focus on that as much as we should have," says Claire Dean, Handspring's director of marketing communications. "That's the good and bad thing about working with early adopters. They're very vocal, both when they're thrilled and when things aren't going well." Even though it didn't go as planned, Handspring believes an e-launch was "absolutely the right thing to do," Dean says. "We feel like we turned it around. We dealt with people who were very upset with us. And the Web launch allowed Handspring to use collected data to refine its retail launch." When the two models of Handspring's Visor appeared in stores early in April, for example, the company and the retailers knew that graphite and blue would be the top-selling colors. Although online product launches are gaining notoriety, they aren't expected to rival retail launches just yet. For one thing, only 32 percent of Internet users have actually made an online purchase, according to the Internet Commerce Briefing by the Intermarket Group. And only 64 percent of Internet users who have used the Web to research products have made a purchase online. WSL Strategic's Liebmann argues that an online launch can be a double-edged sword with the ability to make problems worse faster if a retailer lacks a focused message or sells products that fall short of expectations. An online launch helps marketers "connect to consumers, converse with consumers, and convert consumers," says StartSampling's Burns, "but the product has to deliver." Handspring's Dean, who has weathered the battle but not yet the war, says it's still too early to tell how online launches will fare compared with the traditional retail rollout. "This is kind of new and interesting to watch," he says. "It feels like comparing apples and oranges at this point." But not for long. As we all know, in the Internet Economy change happens at warp speed.